My email replies may be blank so best to call and leave a message and I will return your call. For sale or will part out a 1998 Dodge Ram 1500 4x4. Engine is a 5.2 L ,automatic transmission (reverse doesn't work),manual 4wd transfer case. Only 111 000kms. Glass is good and the interior is clean. Tires are 245/75/16,front tires are @75%,rears @40-50%. New Curt tow hitch. Rebuilt steering box. Trucks starts and moves but it has no reverse, would be a great parts rig or private snowplow if you had a transmission. Chassis seems solid but the body needs a lot or work. Will part out or sell full truck for $500 obo (bring a trailer). May trade for 88-98 Chev/Gmc truck or parts. 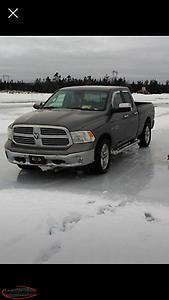 Hi, I'm interested in the '1998 Dodge Ram 1500 Sell or Part Out' posted on NL Classifieds! Please contact me if still available.